It is a busy time of term, preparing, setting and marking exam papers, as well as invigilation…but also a perfect time to relax, collaborate, and rejuvenate with teachers from different backgrounds over a cup of coffee and some scones. . sound inviting…? 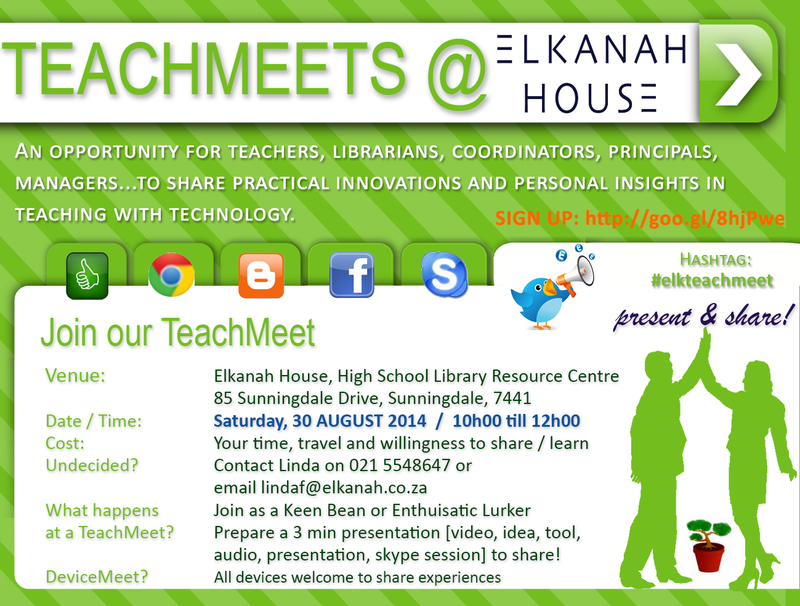 So, you missed the Elkanah House TeachMeet! But not to fear, the next meet will be held on the 30th August 2014 from 10h00 till 12h00. After a quick roam around the popular Elkanah House Schoolyard Market, one could find oneself at the Library Media Center meeting new [and no so new faces] for a morning of catch up and integration chatter! You do not have to own a particular device, nor teach a certain grade or even be a teacher…just an interest in the use of ICT as a tool in education. You do not even have to stay for the entire duration – pop in an see what it is all about – it’s free! Michele Botha from Somerset House started off the session with an introduction to Kahoot. Kahoot is a classroom response system which creates an engaging learning space, through a game-based digital pedagogy. Michele visited her Kahoot at http://create.kahoot.it She asked the audience to use their devices [ipad, phone, tablet] to navigate to kahoot.it. Once we all visited this page using a browser, we were asked to enter a Game pin. Michele provided us with the game pin which we typed into the text area provided and entered our name. Michele then started her game for us all to interact with. It was so much fun, and we all learnt a thing or two from the general knowledge questions she through at us! After each question, we could see our scores on the screen and challenged each other to win the next question. 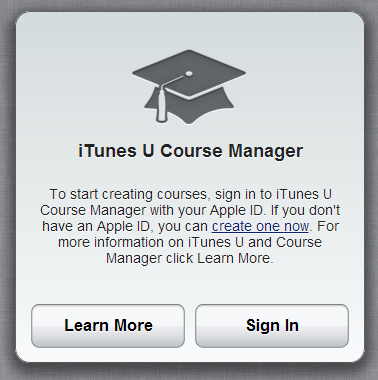 Karen recommends iTunesU as a method of PD for teachers. In a nutshell, she created a course to prepare our teachers for the 1:1 iPad roll out in July. There are 6 Modules covering General iPad Use, The iWork Apps, Apps for Teaching, Digital Citizenship, 1:1 teaching and Models for Understanding Technology Integration. The teachers watch videos, complete tasks with the specified apps, upload to Google Drive when completed and then fill in a reflection sheet for each module. They are currently busy with the Digital Citizenship module which requires them to do the Common Sense Media Digital Passport as if they were students, so they gain a better understanding of what Digital Citizenship is and what this programme teaches the students. Combined with hands-on sessions, an iTunesU course is a very effective way of covering the PD needs of time-constrained teachers. In addition to the above chat about iTunesU, Karen spoke briefly about her Travelling Rhinos Project. 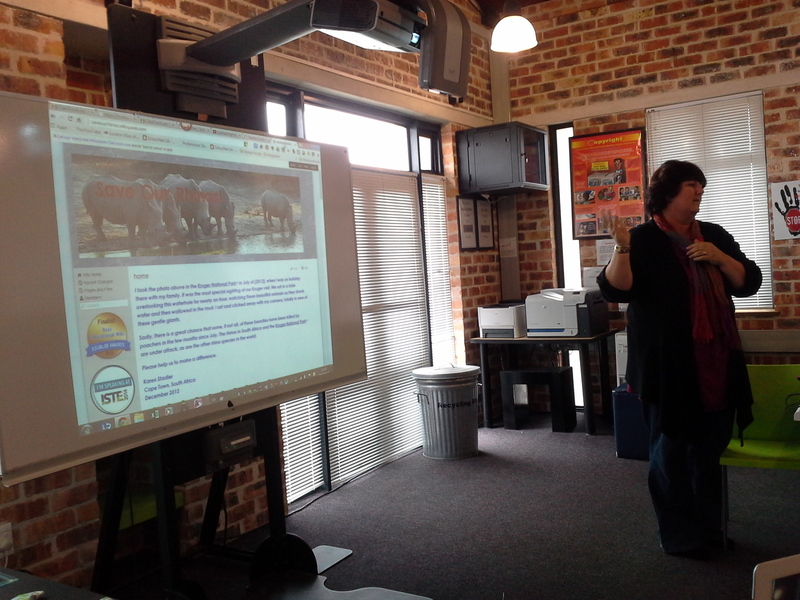 The link to the rhino wiki is http://saveourrhinos.wikispaces.com. All the information is on the wiki. Karen Stadler is the recipient of this year’s ISTE’s SIGOL Online Learning Award. She will be sponsored to ISTE where she will be given recognition in front of 20,000 attendees along with other ISTE Award winners. Well done, Karen! Fiona Beal from SchoolNet SA introduced different Digital Story Telling applications that she had recently enjoyed using such as, PowToon , Google Story Builder, StoryboardThat, Quozio [Make Beautiful Quotes], the Bitstrips app, Pinterest, and last but not least, the African Storybook Project . Liz Broad and Linda Foulkes chatted about the use of Knowmia and the Knowmia Teach app, specifically with regard to the project which Liz had completed with the Grade 7 classes on Fractions. See previous post about Knowmia for more information. 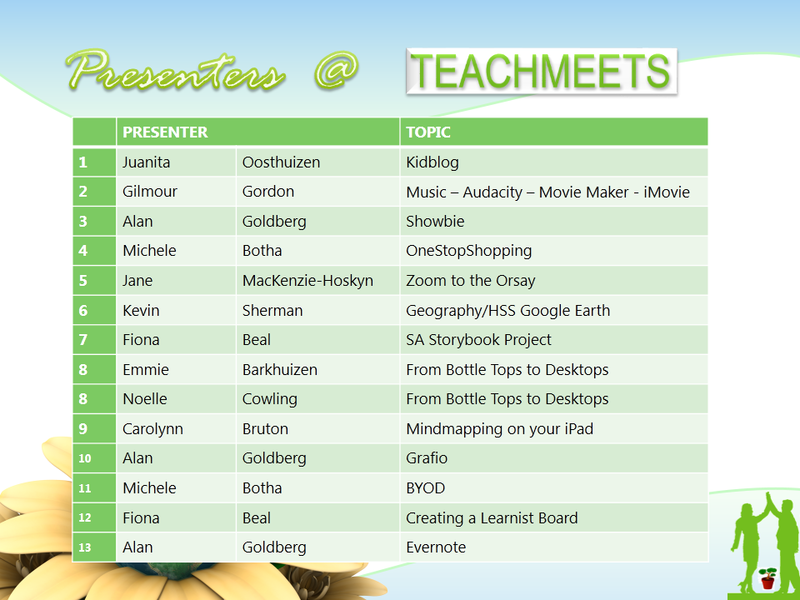 Presenters @ TeachMeet were awesome! We had a wonderful turnout at the TeachMeet @ Elkanah House on Saturday, 8th June! Out of all the attendees we had 13 presentations lined up for the morning. It is absolutely great to see so many teachers share and who are willing to collaborate with others. It was a very fruitful morning for all concerned as we definitely learnt a lot from each and every presentation given. Throughout the meet the TeachMeet WIFI hotspot was available for those who wished to use devices to connect to the internet. Thank you to Stephan Botha, our amazing IT Network Manager. The presentations were excellent….so well prepared…so full of passion and engagement from teachers who are owning the use of technology in the classroom – children are very privileged to be engaged by these teachers in the classroom in this way! of Kidblog. Used avatar maker [illustmaker for blog]. Available as iPad app! Gilmour Gordon had the TeachMeet audience in hysterics as he demonstrated a Grade 7 music activity by actually doing an ab workout. Gilmour’s students had to use movie maker, or imovie to create an ab workout video to 3 pieces of music. Audacity was used to edit tracks using fade in, delete, edit and export functions. Jane Mackenzie-Hoskyn delivered the presentation called “ZOOM TO THE ORSAY”. An alternative and engaging way to stir some interest in learners prior to starting an Art theory lesson. Jane took us on a virtual tour of the Musee d’Orsay in Paris. Walk into the museum and travel, select artwork to view and analyse collaboratively. Technology used: MacBook (laptop) and iPad (tablet), projector, white board, Edmodo for delivery / receipt of work, Reflector, Splashtop for control of laptop to iPad, Google Art Gallery, Google forms, e-mail. This content can also be applied to HSS, Geography and History, using Google Earth instead of Google Art Galleries . Kevin Sherman – Took us on a trip to the moon and earth using Google Earth. Kevin also introduced us to ue layers in Google Earth to view 360 cities and panoramio. He took us on an underwater virtual tour which he used as an English lesson in order to get kids to describe the look and feel of what they experienced. Followed path of a Sea Turtle and Ray virtually underwater to enrich the classroom experience in many learning areas. Kevin also displayed how this tool could be used for Maths to measure distance between two points on the ground. One can also track elevations! 360cities.net can also be used. other very valuable resources for teaching. Alan Goldberg – introduced Showbie for the iPad for easy collaboration between students and teachers.Do need internet infrastructure as cloud based service – one creates class and shares codes with students for access. Showbie creates a shared collaboration folder as read-only. One can collaborate using text notes, voice notes, pdf, camera and the Pages app to name a few. Alan then introduced Grafio, add audio and content to shapes and link them. It is a unique canvas tool that uses the iPad capabilities to allow you to experience freehand drawing. It has shape recognition so redraws shapes if you freehand draw them and connects and allows one to move entire drawing with connected lines. Great flowchart app. huge range of mindmapping tools one can use in the classroom and went through the pro’s and con’s of each and which she preferred to use. Website Carolynn used are mindmapinspiration.com/top-10 and mindmappingsoftwareblog.com. Tool must have dropbox integration and be able to share and export. their interests and curate content around a chosen theme. Fiona also prepared a presentation on the African Storybook Project. Click the presentation below to view the slideshow and others above. What a fabulous morning! Thank you to all those who attended – will let you know shortly when the next meet will be!